INDIANAPOLIS — A large number of worlds found by NASA's Kepler alien planet-hunting space telescope are probably significantly larger than scientists previously estimated, a new study suggests. The Kepler Space Telescope has spotted more than 2,700 potential exoplanets since its launch in 2009, and scientists using the Kitt Peak National Observatory Mayall 4-meter telescope have categorized the home stars of many of those planet candidates for the past three years. In particular, the researchers made detailed follow-up observations of 300 of the stars Kepler found likely to be harboring exoplanets. 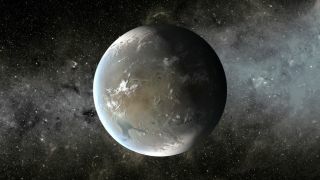 In total, the stars observed by Everett and his team host more than 360 Kepler planet candidates, as some of the stars were found to have more than one satellite. "While Kepler is the discovery machine, it takes both Earth-based and space-based telescopes to truly understand exoplanets and how they relate to the stars they orbit," said David Silva, an astronomer at the National Optical Astronomy Observatory who contributed to the study. Ground-based follow-up observations of stars studied by Kepler allow scientists to identify which planets, if any, may be capable of supporting life. "Determination of accurate stellar sizes allows astronomers to more accurately identify which exoplanets are Earth analogs, fulfilling a key goal of the Kepler mission," said Steve Howell, a Kepler project scientist. Howell presented the new findings here today (June 4) at the 222nd meeting of the American Astronomical Society. Kepler has been suffering from some serious health problems recently. An essential wheel used to keep the telescope in position while planet hunting failed after showing signs of increased friction for about the past five months. Engineers are still trying to get the telescope back online, but if they can't, the mission might be adapted to fit Kepler's new mode of operation. Instead of staring deeply into one part of the universe, the telescope might be able to scan the sky broadly, researchers said.